I’m often criticized for not being more open about my movie tastes. According to the sentiments of many acquaintances, I can’t enjoy a film unless I’m being tested. A movie has to make me think, it has to be based in truth, it has to be subtitled and made under X amount of money. I’m unable, they say, to appreciate the characteristic that films are specifically designed to do: entertain. All of this, I often defend, is completely untrue, but their claims are not without merit. Yes, I do prefer that a movie test me, both emotionally and mentally. No, I do not think films are primarily made to entertain. Yes, if you asked me to create my top 100 films of all time, 60 percent of them would not be in English. But that doesn’t mean I’m not open to whatever is being projected. When I sit down in a theater, regardless if the screen will soon be filled with The Tree of Life or Transformers 3, I sit with an open mind. Every film is given a clean slate; no judgments are made prematurely. It’s quite simple, really. For me to enjoy a film, it needs to be one of two things: something I’ve never seen before, or something I’ve seen dozens of times, only done distinctively. That laborious preamble is made to draw attention to a new film that falls into the former category, but is inexplicably entertaining. The film is Nicolas Winding Refn’s Drive. It is unlike everything I’ve ever seen, and it is utterly flawless. Drive begins with an extended pre-credit sequence that rivals any opening scene from any film made in the last decade (or the one before, or the one before that). It’s quick, smart, impossibly suspenseful, grandly conceived and ingeniously executed. And did I mention that it’s accomplished with its star, Ryan Gosling, not uttering a single word? To crudely summarize the film’s plot, Gosling plays a Hollywood stunt car driver who moonlights as a getaway driver for thieves in need. Shortly into the film, two important things happen: he befriends his timid, disarming neighbor (Carey Mulligan) and gets involved with a few low-level criminals who will do anything, and hurt anyone, to make a buck. Like all great films, issuing a two sentence plot description in no way does the movie justice. Also like all great films, to divulge details any further would be criminal. Drive, according to its director, who’s best known for his romper stomper action flick Bronson, was inspired by original fairy tale stories (you know, the ones where Cinderella’s step sisters slice their ankles off to fit their foot in a glass slipper), and electronica music. Drive has both, but not without every frame being firmly cemented in reality. This is a highly stylized picture. Colors are heightened, slow motion is often utilized, music (both the songs by various electronica bands and an original score by the great Cliff Martinez) swells, then fades, then swells again; all lending itself to a wholly original work of art. 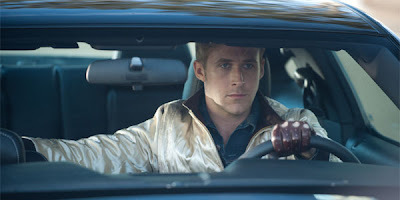 Ryan Gosling, matching the career high he set last year with Blue Valentine, is mesmerizing as The Driver. He moves slowly, speaks purposefully, and always appears to be three moves ahead. He’s a calculating bruiser of a man. The kind of guy who says very little, but is constantly speaking volumes. His Driver is the best acting performance seen on screen so far this year. Additionally, each supporting player fits into Refn’s world seamlessly. Carey Mulligan delivers the caliber of performance we’ve grown to expect from her, and then some. The fact that her character was scripted as a Latin woman, which was quickly amended once Refn met Mulligan, says a lot about what this incredible young talent brings to a film. Bryan Cranston, Ron Perlman, Christina Hendricks and especially Albert Brooks (in a career-best performance) all dive head first into the material. Chopping at the bit and loving it. Oh man, great review! I can't wait to watch it again. Despite a few minor problems I had with the film, I agree that the opening sequence is one of the best I have seen in recent memory, and Gosling, Brooks and Cranston deliver excellent performances. Carey Mulligan is my crush of 2011 and I usually love her in everything...not so much this time. As I said on my review comments, I expect my opinions to change when I sit down to view the film again. Well, wasn't that a great review! simple, yet very informative and entertaining- i'm definately going to watch it soon! I feel a little bit guilty saying that Drive needed more driving. When the action comes it is tense and artfully done without shying away from the extreme violence, but that all starts to go away as soon as the characters start talking, or sighing and looking at each other. Nice review Alex. Check out mine when you get a chance. @ Aziza, thanks for your nice comment, I really do appreciate it. And yeah, I cannot recommend this film highly enough. @ Dan O., I see your point; this is definitely more of an existential thinker than a rock 'em sock 'em action flick. Honestly, I thought it'd be more polarizing than it has been. I thought people would love it or hate not, not love it or kinda of like it. At any rate, thanks for reading! I really liked the realism of it. No over-the-top car chases. Just calmly driving, then speeding up and avoiding things when necessary. No music. Really, really well done. Enjoyed your review. This is the best film I have seen since The American. What kind of message do you think Refn was trying to send by having Driver only use American cars? Also did anyone walk out when you saw the picture? Yeah it's a badass flick. Glad to hear you like The American, I think we're 2 of 13 people who saw that movie. No walkouts, several audible gasps though.. You? I saw it yesterday and I loved it; Ryan Gosling killed it! I want to see it again! So glad you liked it, I need to see it again, badly. The soundtrack made my day, and will share three of the tracks soon on my blog. 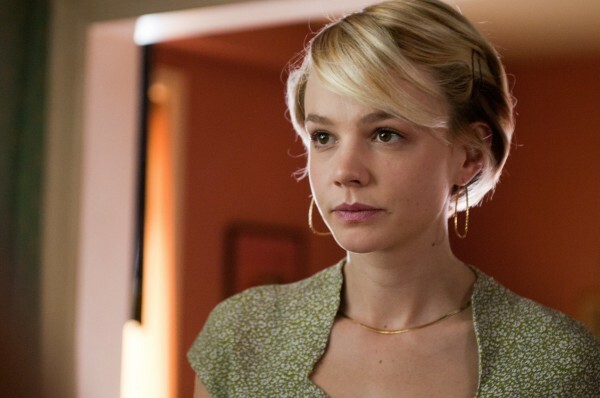 Maybe Carey Mulligan’s character was too bland, and never more than just a pretty face. Although, action films seldom have great characterization anyway, so maybe I'm excepting something that was never intended for the genre? I thought the violence was definitely extreme, but somehow oddly appropriate for the heavily stylized world the director created. Yeah the music was crazy good, from Cliff Martinez’s score, but the songs as well. I bought the soundtrack the day I saw the flick and I’ve been listening to it nonstop. Great stuff. See, to me, I thought Mulligan (and everyone else in the cast) was absolutely perfect. I loved the lack of dialogue; everything was emotional expression and the subtlety of movement. Definitely not for everyone, but Drive was damn near masterful to me. What did you think about the first images of The Neon Demon? I think it will be amazing. It looks amazing. I hope for the best. I'm into it, for sure. Can't wait to see how it turns out.